Innovation is key to delivering the necessary services to those at risk of losing coverage. This is especially notable with those with two or more chronic conditions. Change in the world of medicine is inevitable. We see this in legislative changes threatening to decrease the reimbursement of physicians and increase in the patient share costs. Innovation is key to delivering the necessary services to those at risk of losing coverage. This is especially notable with those with two or more chronic conditions. In 2014, with the advent of MyCare Ohio, our practice experienced a surge in patients with multiple co-morbidities. MyCare Ohio is in the state’s Dual Demonstration, a system of managed care plans selected to coordinate the physical, behavioral and long term care services for individuals over the age of 18 who are dually eligible for both Medicaid and Medicare. These patients had never seen a physician nor been diagnosed and were now dealing with life limiting events such as stroke, diabetic neuropathy, limb loss, kidney failure, and morbid obesity. With their new health plan, patients not only sought out the care of a primary care practice, but also took advantage of hospital services and reduced cost medications. They had no understanding of newly diagnosed diseases and even less understanding of what life changes were required to maintain their current independence. Long term chronic illness without treatment leads to permanent damage to vital organs and systems. The continual cycle of noncompliance to life style changes (Plans of Care) leads to a declining condition, and fight for stabilization. All of which creates a perfect storm rapidly driving up costs of treatment for these individuals. With the reform of healthcare, physicians are now measured by the success of outcomes of treatment demonstrated by the reduction in hospitalization rates. This new measuring stick caused physicians to micro manage patients or stop treating these patient types all together. 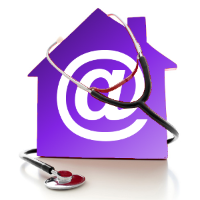 At Home Medical Professionals (AHMP) opted to continue to treat these patients by utilizing innovative tools. We'll skip the double opt-in, if you promise to share your real email address. You have successfully unlocked this content!